Add a punch to your Halloween Punch! 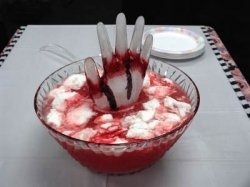 Add a bit of creepiness, to your Halloween Punch at your next Halloween party, with this quick and easy DIY Halloween chilling hand. This ice cold hand will keep any Halloween punch recipe cold and shocking plus entertain your ghoulish guests. Your guests will certainly be surprised when they see a hand rising from or floating in your punch bowl! And what better way to keep your Halloween punch chilled. I can’t believe I didn’t think of this ingenious and easy idea! I found this idea on Celebrations.com These chilling hands will keep your punch cool for most of the evening, but just in case it fades away, I made a few extra and kept them in the freezer. I found it was a good idea to fill the gloves with the punch this keeps the punch from getting “watered” down with regular ice. If you want to make the hand ugly and ghoulish add a bit of food coloring… blue mixed with red punch is so bad. Let your imagine go wild. Ask the kids what is creepy… I’m sure they will come up with some things you never dreamed of! Rinse out your glove with water. Fill your pitcher with your punch — about one cup. Pour liquid into glove. Check the fingers… they need to be full to the tips. Twist the top of the glove closed. Wrap tape or a twisty around the top of the twisted glove top. Do it tight so you won’t have any leaks. Place glove a Ziploc bag or a container into the freezer. This is to protect your freezer from any spillage. When the hand is frozen solid, remove from the freezer, cut the latex glove and gently remove from the frozen hand. 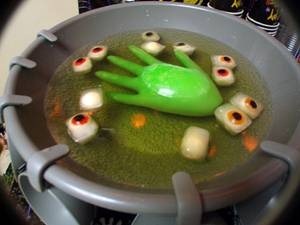 Place the frozen ghoulish hand in your Halloween Punch! You might want to throw in some eyeballs, or worms. EEEEKKKKK. 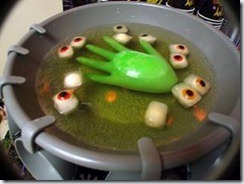 Let me know how you add creepiness to your Halloween punch!